The Arcadia gift card can be redeemed by visiting any of the Arcadia Brands stores in the UK. 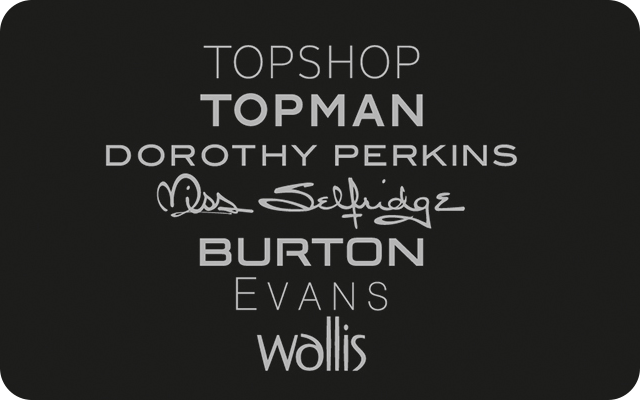 It can also be redeemed on any of the Arcadia branded websites to include Burton, Dorothy Perkins, Evans, Miss Selfridge, Topshop, Topman and Wallis online. By Print When redeeming your eGift card by visiting one of the Arcadia Brands stores in the UK only, you will simply need to either present your eGift in a printed (pdf) format at the till point or present the electronic version of the eGift card on your mobile device to the Cashier at the till point. Online When redeeming your e-Gift card online, you will need to input the (16 digit) card number and the (4 digit) PIN code at the payment page of the online checkout. The Arcadia eGift card can only be redeemed in participating Arcadia Brands’ stores in the UK and on the Pound sterling websites of the Arcadia Brands (excluding Outfit). It cannot be used in Arcadia Brands’ concessions in department stores. The eGift card cannot be refunded, exchanged for cash, used to purchase Arcadia Brands’ gift cards or eGift cards or used to settle Arcadia Account Card balances. Any balance remaining after use of the egift may be applied to future purchases.